Refreshed after our midterm break we are back to school to get stuck into our practicing for the Christmas play, working on our winter projects and of course counting the days until the holiday season. 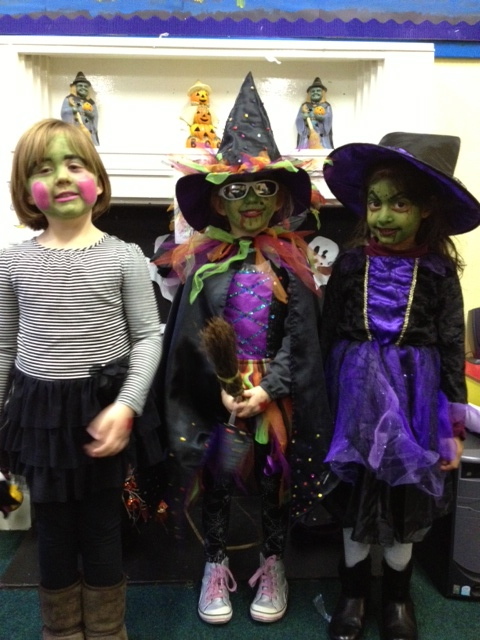 Before the midterm we had a frightful amount of work done and lots of good-goulish fashion fun at our Halloween events. Our reception and senior class enjoyed a trip to Pine Forest art centre for a morning of outdoor fun and art and craft. 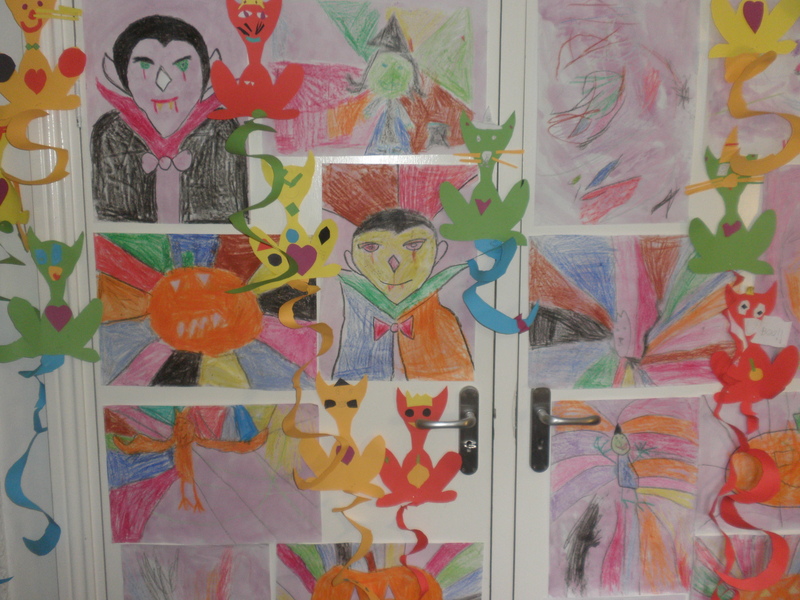 Some of the results of their creativity were displayed on the foyer walls. Everyone had a great day and enjoyed the bus journey and exploring the grounds of the art centre. 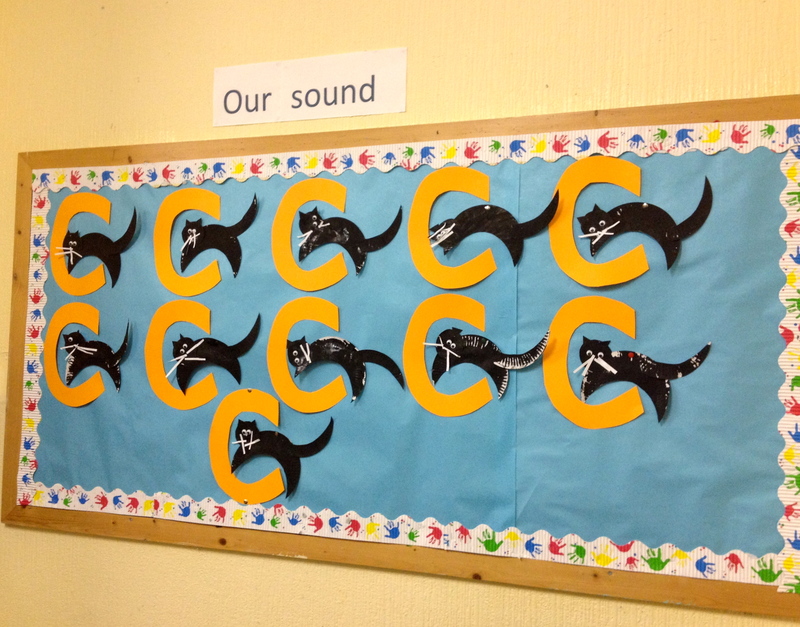 The nursery class worked on their sound C for cat, as we use phonetic sounds to assist the child later with word building and reading please feel free to ask our teachers Magna & Lisa for the phonetic sound of each letter so you can follow along at home. They made midnight black cats to reinforce the starting sound in a visual way. Art took on another “body” of meaning with some fancy foot and handprint pieces to add to their ever-increasing art portfolio. 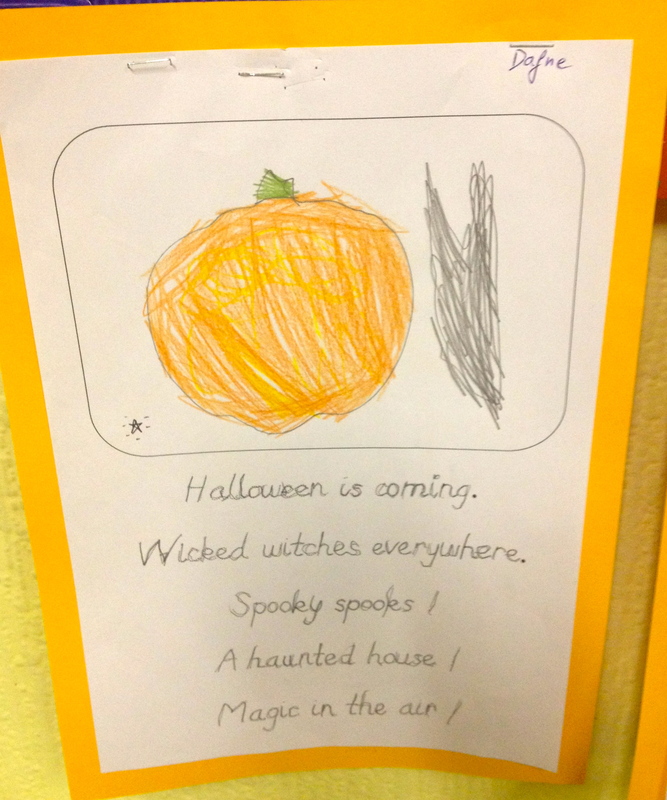 Hand print trees and foot print ghosts adorned the walls as footprint witches flew on their brooms lending a spooktacular air to the nursery walls. 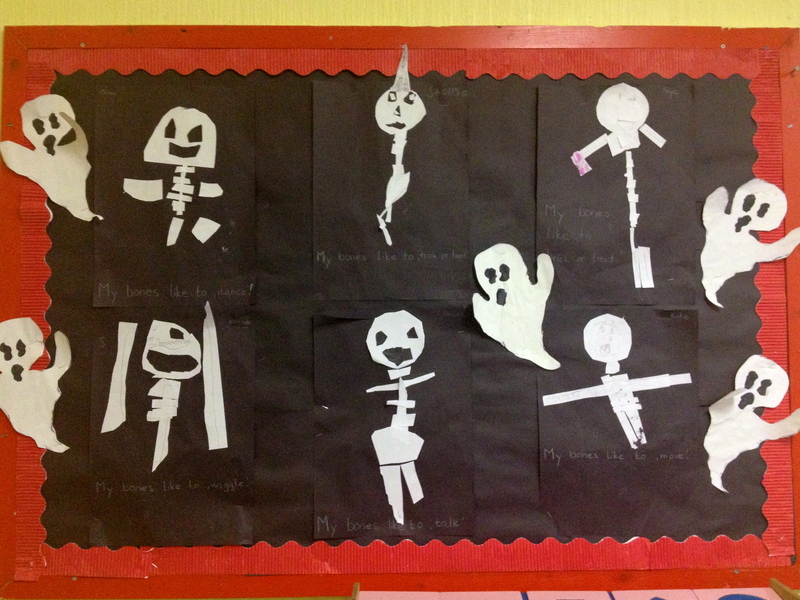 I have to say my favourite are the freestyle Frankensteins made from geometric shapes and displaying some great scissors skills from the children in the class. 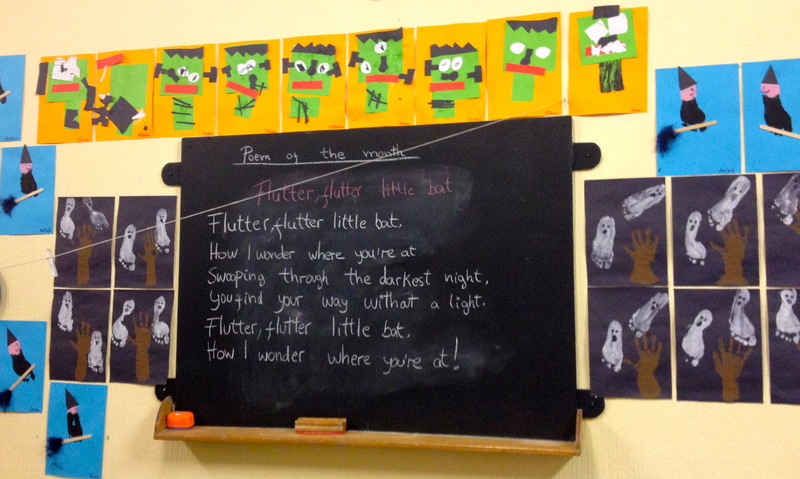 The poem of the month “Flutter Flutter Little Bat” I’m sure was recited many times over at home as they really enjoyed learning it and absorbed it so quickly. 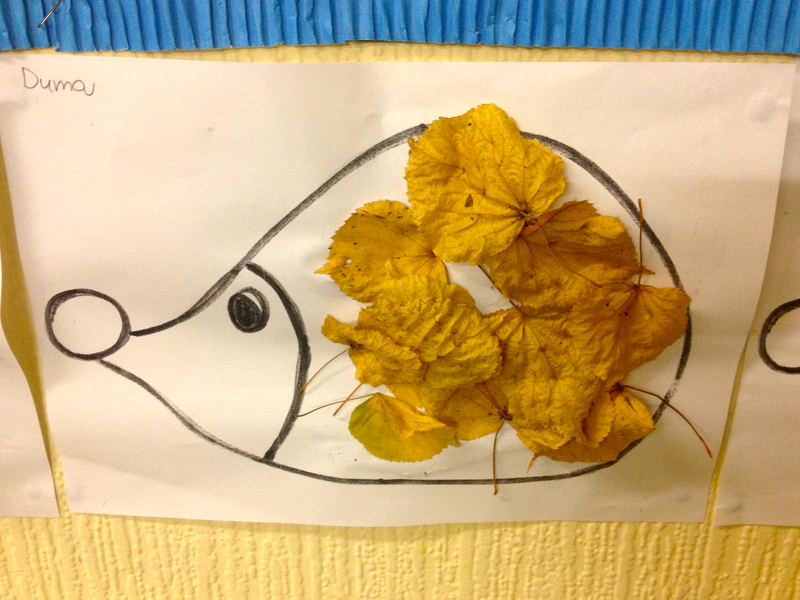 Finally the nursery children were continuing their seasonal nature studies with some adorable leaf filled hedgehogs, made from the leaves collected on our many walks around the beautiful Merrion Square as we soaked up the changes Autumn brings to our wonderfully appointed natural playground! My bones like to …..
Personalising each of their bony portraits! Montessori believed that subjects should not be taught in isolation, but that the child in choosing a project or work would naturally come into contact with art, literacy, maths, science, geography, history & culture. None of these subjects are experienced in isolation in the everyday world therefore it is natural for the child to absorb all subjects and utilise their learning to scaffold further discoveries. 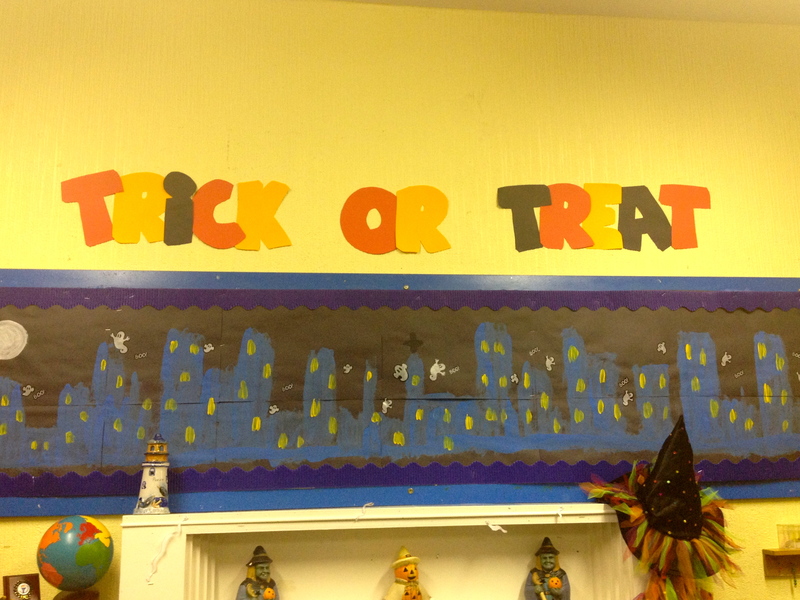 In our classroom environment we ensure that projects and lessons are undertaken with this in mind, and it can be witnessed in the boards and work displays around the class. Our language arts were on display with some scarily good writing samples and some logic skills and fine motor work with our web mazes. The group art project over the fireplace lent an atmospheric chill as it depicted a night-time cityscape haunted by friendly spooks. 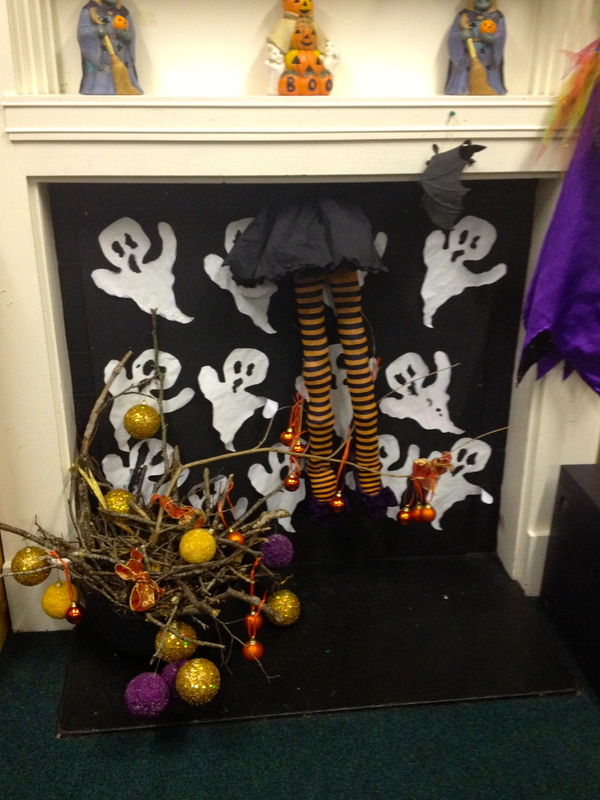 Of course the piece de resistance was the tableau of a witch caught in the chimney! Bravo Reception Class. Not to be outdone the senior class followed the thread of their earlier sewing and stitching projects by weaving webs using hula hoops! 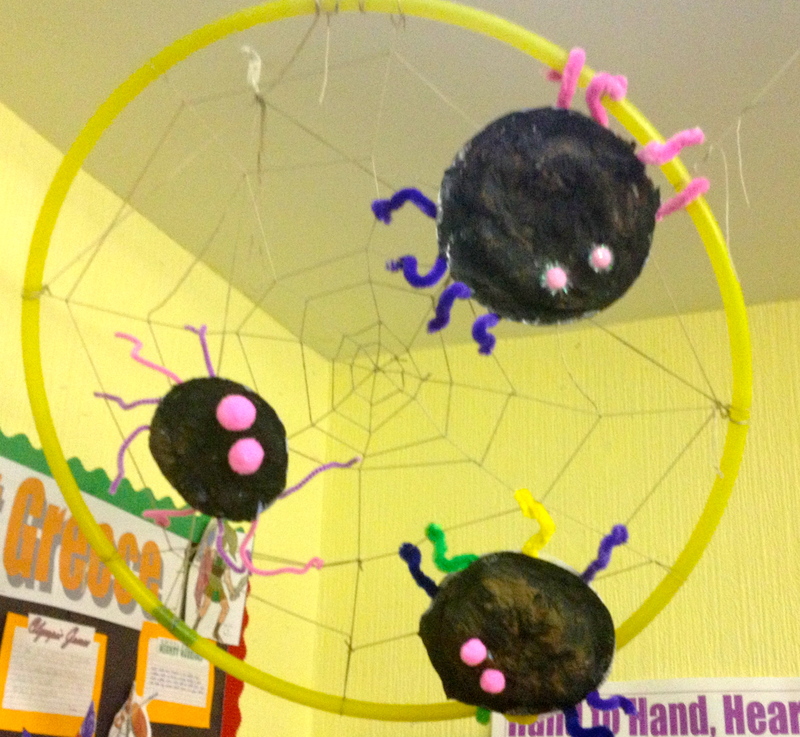 These wonderfully large and evocative webs hung over the classroom and were themselves adorned with large spiders waiting for their supper! 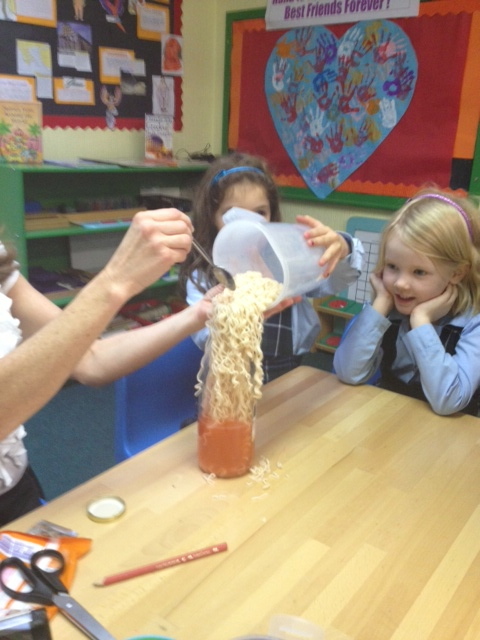 The class were very busy secretly making the ingredients for our annual Witches Walk. Creating a list for our silly old sorceress who would have to lead the school on a hunt for the ingredients to ensure her safe passage back to her home for the year, the class worked steadily using their science skills and considerable imagination to make many potions and brews to get the job done. 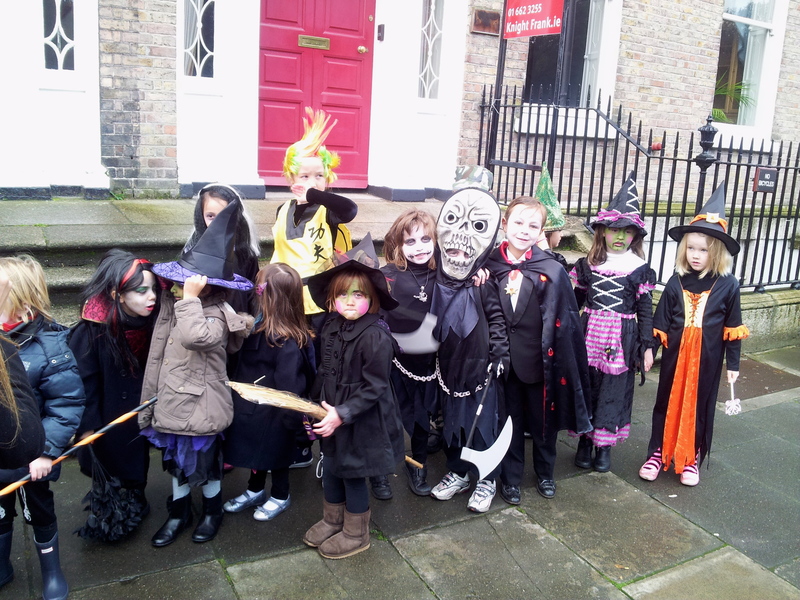 Some of the students ready for the witches walk. 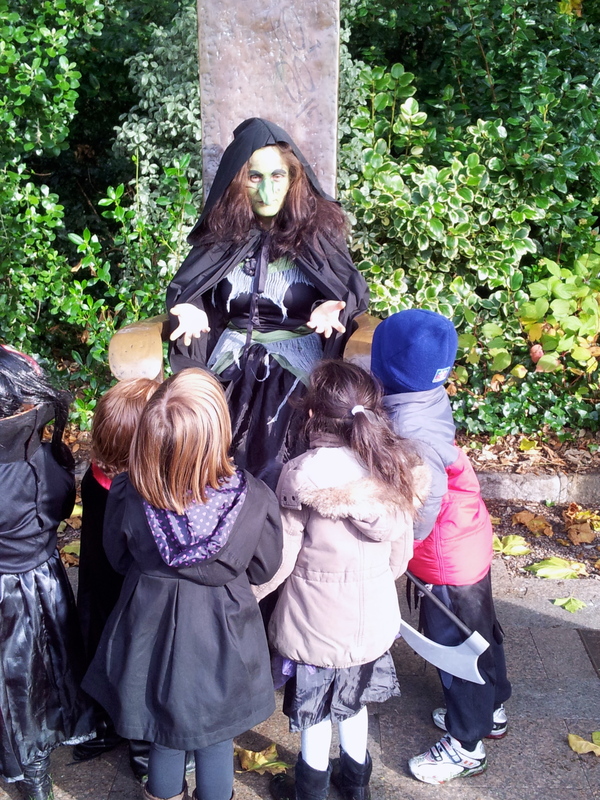 On the day of the Witches Walk all our teachers were in frighteningly good form dressed to the nines in costumes ready for all the fun. 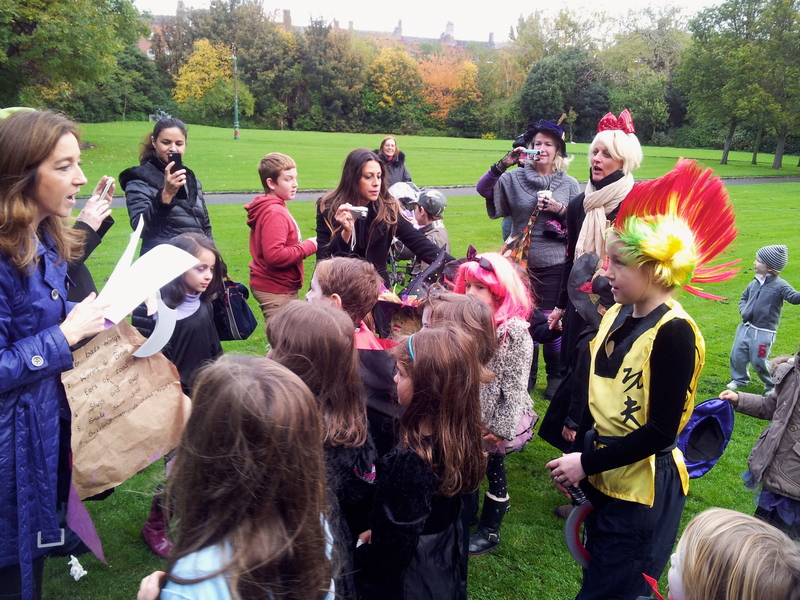 Face painting and stories, games and a party all before 11.30am when we went in search of the witch and her ingredients. We found her and got to work, searching high and low throughout the square stopping only to recite our poetry and sing our songs for the gathered parents and friends. Finally when all was found we helped the Witch cast her spell and lo and behold before our very eyes she vanished off for another year. I thought this was a Witches Walk! Why are you sitting? Checking the list for the witch! Halloween 2012 was our best yet and we cant wait to show you how we celebrate the winter holidays, Diwali, Hanukkah and Christmas!